Backups are important. This is especially true when almost all the important data like photos, videos, documents, essential files, etc., are being stored in your phones and computer. After all, there is no way of telling how, when, and why you’ll lose your data. In case you are wondering, there are a million different ways you can lose your data like virus infections, ransomware attacks, stolen devices, device damage, data corruption, etc. So, after considering all the ways you can lose data or after having a first-hand experience the data loss, you try to launch your favorite backup program to the backup important stuff. However, with all the backup types available in the backup program, you’ll get quickly confused. If that’s your situation, I’m here to help you as much as possible. The good thing is, they are not as complicated as you think they are. Here are the backup types explained. The name says it all. When you do a full back up, you are backing up the entire data without any exceptions whatsoever. The advantage of full back up is that it takes less time to restore it. However, the disadvantage is that since you are taking backup of the entire data set, depending on how much data there is, it can take quite a bit of time to create a backup. Not to mention, it will take a huge amount of storage space to store all those backups, if you are creating full backups daily. Just imagine creating a full daily backup of 100 GB data. 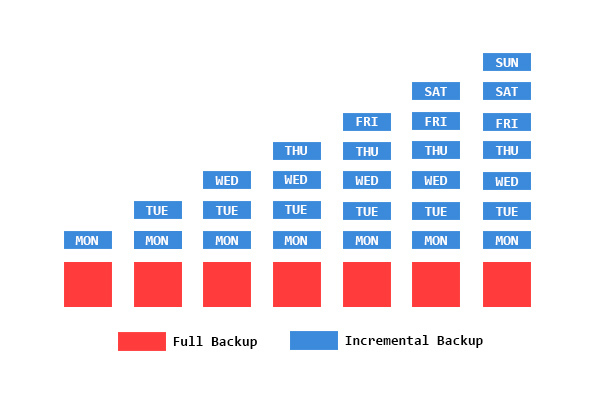 To avoid this, full backups are usually done periodically, like once a week or month and then compliment that full backup with incremental or differential backups. The incremental backup scheme is created to mitigate the disadvantages of full backup scheme. When you create an incremental backup, all you are doing is backing up all the changes since the last backup. For example, when you create an incremental backup on day 1, the backup program will create an initial full backup. On day 2, the software will create a backup of only the changes made since day 1. On day 3, the incremental backup will contain only changes made since day 2 and so on. This backup method significantly decreases the storage space needed to store backups as you’ll only have one full backup and all the other backups are just changes made since the last backup. Though the incremental backup offers great storage savings, the downside is that when compared to full backups, it takes more time to restore. Also, you need to have all the backup files when you want to restore. If you are missing even one or two backup files, you cannot restore the backup. 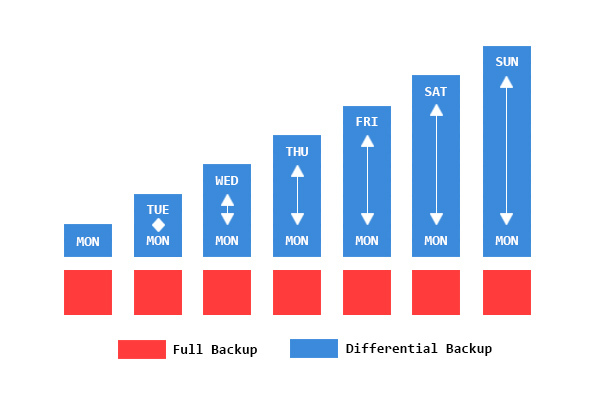 The differential backup scheme is very similar to incremental backup in that it saves a lot of storage space and speed up the backup process compared to full backup. However, one significant difference is that the differential scheme will back up all the changed data from the initial backup. This contrasts with the incremental scheme which backs up changed data since the last backup. As an example, when you create a differential backup on day 1, it creates a full back up. On day 2, it will create a backup of all the changes made since day 1. On day 3, it will again create a backup of all the changes made since day 1. As you can guess, the day 3 differential backup will contain all the changes made on day 2 and day 3. A differential backup is very useful when the data is being constantly added. When you want to restore, you need to the initial full back up and any one of the subsequent differential backups. Even if the old differential backups get deleted, you can restore data using the initial backup and one differential backup (presumably the latest one). A mirror backup is nothing but mirroring the source to some target drive or place. When you mirror the data, you will have the same data in two different places. However, when you make a change in the source data, that change will be automatically reflected in the mirror backup. For instance, if you delete a file in the source drive, that same file will be automatically deleted on the backup drive. You can think of Mirror backup like the sync feature provided by many cloud services. Typically, mirror backups are not used to store backups rather for replicas. Synthetic backup is created in complement to the incremental backups. In the backup process, a Synthetic scheme will take a full backup and any incremental backups to create a single full backup file. Simply put, Synthetic backup is not a direct back up of your data. Rather it is a backup created from your already existing incremental backups. Synthetic backups are generally used to speed up the restoration process and save bandwidth while transferring between networks. You won’t generally see Synthetic as an option in many backup applications. Local backup is not an actual backup process but the act of storing backups on the same device or at hand. When I say at hand, I’m talking about storing it in other places like external hard drives, USB drives, DCD/DVD, NAS (Network Attached Storage), etc. The advantage of local backups is that you can quickly restore your data as and when needed. An offsite backup scheme is opposite to the local backup scheme. While you store backups locally in a local backup scheme, you store all your backups far away from you, like in another geographic location. Generally, backups are created locally and then they are transferred either physically or on a network to an offsite location to protect the said backups from any uneventful situations like natural disasters, man-made disasters, etc., at the source. Often, offsite backups are done in addition to the local backups. Online backup is very similar to the offsite backup; however, one significant difference is that the source is directly connected to the offsite location via a network and is being backed up constantly or as and when needed. Cloud backup is very similar to the online backup. In fact, you can use online backup and cloud backup names almost interchangeably. Cloud backup generally provides easy access to your backup and other files from anywhere you want after user authentication. The advantage of cloud back up is that it is flexible and highly scalable. To get a better idea, you can think of Google Cloud Storage, AWS (Amazon Web Services), Microsoft Azure, Dropbox, OneDrive, Mega, etc. Now, you might be thinking what are some good backup software to backup are the operating system and/or other important files and folder. I would personally recommend you go either with Macrium Reflect or AOMEI Backupper. Both this software offers essential features like differential backup, ability to browse backed up files, scheduling, etc., for free. Hope that helps. This is a very high-level overview of different backup types that you generally see in most backup software and solutions. If you think I missed any mainstream backup type, then comment below and I will add it to the list.